Photo credit: Ny, CC BY 2.0. On a recent trip back home to the Pacific Northwest, I picked up a pair of wooden circular knitting needles in size eight and a skein of wool and hemp yarn ($22.25). It was a cold and dreary day in December and I had the vague idea that knitting would be both a cozy indoor activity and an anxiety-busting habit. Since picking up the needles, I’ve developed a true habit — and financial burden — in knitting. It’s no wonder why. Studies show that overcoming and mastering small challenging tasks (such as knitting) gives you quick hits of dopamine — a mood-enhancing, feel-good chemical naturally released in the brain. And I was hooked. I love the act of choosing a beautiful fiber spun into threads of yarn, to be stitched into an actual, tangible fabric — by me, no less! The lure of DIY-ing hearkens back to an imaginary-but-simpler time of pioneering and self-reliance. The idea of mastering a skill that could potentially clothe and protect someone from the elements set me on a mission to hunt and gather the raw materials by way of online shopping. Only, now that I had this homesteading fantasy in my mind, supplies seemed both scarce and vital to sustaining life through the barren winter. Better stock up now, before the next big snow! In a quick succession of transactions at both my local yarn store (referred to by knitters as “LYS”) and Yarn.com, I purchased $971.83 worth of yarn, patterns, and supplies. I then purchased a complete interchangeable needle set on Amazon for $115.29. Thus far, all I have to show for my obsession is a handful of scarves and a couple of beanies. Let me explain. After playing with the first purchased skein of yarn, I decided I was ready to make a scarf. I went to my LYS and asked the staff how many things of yarn I’d need to knit one scarf. Three skeins. Also, to knit super bulky weight yarn, I’d need needles to match ($49.44). After knitting my first scarf, I decided I was ready to knit a sweater. I picked out a free pattern on Ravelry and went right back to my LYS to ask what exactly I needed to make my intended object. Turns out, I needed a bunch of size six and seven needles in different lengths, as well as double-pointed needles ($36.48). Overwhelmed by the number of skeins I’d need for a sweater (four or five), and the sheer volume of options at the store, I decided to wait to buy yarn until I did some research on which type of yarn would best suit the sweater pattern. This is where I started to get a little overambitious. I went to Yarn.com and purchased seven skeins of light gray, wool and alpaca, worsted-weight yarn, seven more skeins of the same yarn in a dark heather gray color and four balls (I still don’t understand the difference between skeins, hanks, and balls) of an alpaca, merino wool, and silk worsted-weight yarn in a camel color. I bought the first two yarns in the hope that one of them would be a good candidate for the sweater and the last one in the hope that it would make a beautiful scarf ($121.37, including shipping). Turns out I still had a lot to learn about knitting. 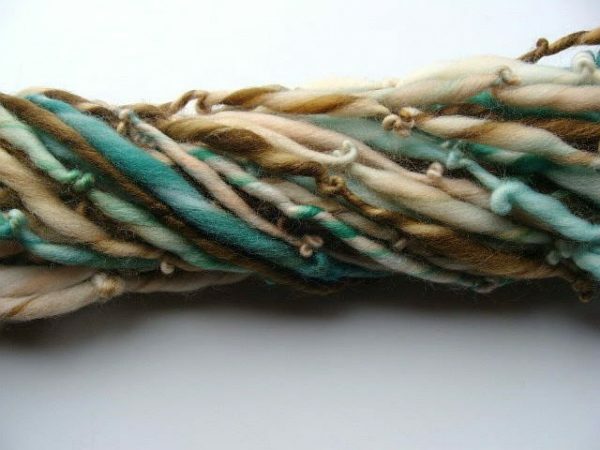 For starters: there is a difference between light-worsted and heavy-worsted weight, and the very classification of yarn can be arbitrary, especially given the fact that the combination of fibers making up the threads can yield a different width, or “loftiness,” that impacts the final density of the knit fabric. I also learned why expert knitters urged others to always knit a swatch before diving into a big project. After this first big online order, I knew I’d be buying and returning many units of yarn in search of the right one for my sweater. I knit the four balls of the camel-colored yarn into a scarf as I made more orders ($163.28, $176.69 and $244.92). With each order, I ripped into one new yarn after another, swatched for the right gauge (as indicated by the sweater pattern), and came up short. Swatching for gauge, or the exercise in finding out how many stitches and rows fit into one four-inch by four-inch square of knit fabric, is a disparaging endeavor. What if you get the right number of stitches, but not rows? What if you like the way the fabric turned out and don’t want to try to alter the density by going down in needle size to get gauge? I’ll tell you what happens. You try new yarn. Or, you start looking for new patterns ($17). Around this time, my friends and family became aware of my knitting ventures. Requests to knit a scarf came in, and with that, a new order for scarf yarn and another yarn to try out for a different sweater pattern ($140.40). For now, I’m going cold-sheep (a knitting term that refers to a yarn shopping ban) until I decide which yarns to keep and to use and which to return. Unfortunately, only the unopened units of yarn can be returned, but I think I can recover half of what I’ve spent. This absorbing hobby rendered me defenseless against natural fibers and the thrill of mastering one stitch, then a new, more challenging stitch, a new cast-on method, joining stitches in the round, and binding off in kind. Coupled with the new, unexpected obsession of pairing the right yarn with the right pattern, I found that the hobby occupied much of my brain space and much of my time outside (and, let’s be real, inside) of work. There is no end to the incremental skills to learn and to master, in the hopes of becoming a sweater-knitter in sweater weather. I couldn’t help but wonder why the process and journey of mastering a skill like knitting is so much more rewarding than it can feel to make likewise painstaking steps towards one’s financial goals. Is it the intangibility of adding a percentage of your pay to your retirement account, every other week, indefinitely? Or the fact that human beings are notoriously terrible at imagining themselves 10, 20, 30 years older? Or maybe the two ideas aren’t analogous at all, and knitting is more akin to therapy or buying a daily latte because it keeps me keeping on and feels like a treat for being a responsible adult. Or perhaps knitting can be compared to soap-making. Both crafts yield something useful and beautiful, but it’s a lot easier and cheaper to buy soaps and scarves ready-made — albeit less thrilling. Still, taking pleasure in an expensive hobby or the daily treat — regardless of how it may delay home ownership or financial independence — can encourage us to remember fun and enjoy life today, too. I wish my knitting were a more frugal hobby, but for now, I’m happy to have found an enriching way to pass my time. Michelle Song does things including writing, editing, and nurturing a Meyer lemon tree. She is an older Millennial who is unlikely to be found anywhere but her inbox at michellesong101@gmail.com.